Back in 2002 Porsche upset a lot of critics by releasing their first SUV, the Cayenne. It had a bad reception due to it’s “Marmite” looks, but fortunately for Porsche, the performance figures (especially of it’s top-end Turbo model) meant that it was a hugely successful car. I have always been a fan of its brash and over-the-top looks, but that’s just me! About a week ago my brother was having his 2009 Porsche Boxster S serviced by Porsche Centre, Cambridge and due to the terrible weather we’ve been having, they offered him the above car. It’s a 2012 Porsche Cayenne S with just about every bell and whistle you can imagine! It features a 4.8l naturally aspirated V8 that pushes out 400bhp with an 8-speed tiptronic gear box. On start up, it sounds great, it has a lovely deep V8 burble that suits the look of this huge 2-tonne beast. The driving experience is a bit odd to be honest, and takes some getting used to as it’s not like driving a Range Rover as the cabin is more like a big saloon with the centre console nice and high and the seating/steering-wheel position in front of you, but it’s also not a saloon as you are clearly much further off the ground. I only drove the car in full sport mode which basically meant the car sits a bit lower to the road, the gear box lets the revs build up a bit more between changes and the throttle is a bit sharper. It felt great, not like the Range Rover Vogue we have tucked up on the drive at all! It felt a lot lighter on it’s feet and handled more like a shorter road car. The power is very noticeable and so is the foot down acceleration – it has a 0-60 of 5.7 seconds which is about the same as a BMW 650i – that, in any ones book, is impressive for an SUV! 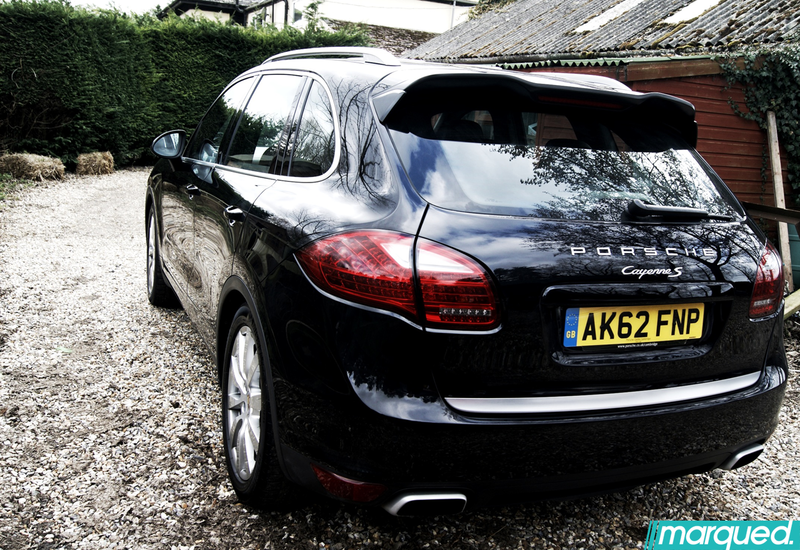 All in all, I really like the Cayenne – I always have and this newer facelift model is great! It’s very easy to live with with nice light electronic steering and a smooth ride with not too much wallowing in the corners. My only real negative points are about the interior and the completely made up official mpg figures. The interior did have too much going on and the feel of the buttons on the dash and centre console were very cheap to the touch. Looking at the dials at night was a bit like looking at a screen at a stock exchange with all the different lights. However, the important bit is the actual car, which is great. If you’re looking for a sporty 4×4 that’s on par with the Range Rover Sport, but (in my opinion) a bit more, then this is the car for you. Also the Porsche owner experience is great, their customer care is brilliant. I have also had the luxury of going out on a purpose built off-road course in one of these and it really opened my eyes to what it is capable of off the road, as well as on it.